With over 55% of consumers beginning their product searches on Amazon, the world’s largest online retailer has grown to become the most powerful product search engine and marketing platform on the planet. Even if most of your sales take place elsewhere, you will be wise to list your products on Amazon to help them get discovered. The challenge is that with Amazon’s digital shelf holding more than 360 million products, you’ll need to make yours stand out! If you’re a vendor on Amazon, you have two options for rising to the top of Amazon search results. You can gain visibility for your products organically. Or you can pay to advertise. Let’s look at each option in more detail and go through some things you can do to rise to the top of Amazon search. When you search for a product on Amazon, you’ll land on Amazon’s Search Engine Results Page, or SERP. The SERP offers a list of paid search results as well as organic results. Your goal should be to get your products as high on Amazon’s organic results as you can. 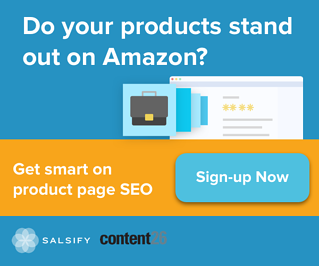 How does Amazon determine which products are relevant to your search? There are many factors, with product page content playing a vital role—and one that you can fully control. There are two basic types of content on Amazon, what we call “essential” content and A+ content. 1. Essential Content. The “essential” content includes your product images, title, feature bullets, and short product description. You should follow Amazon style guidelines when you create this content and include the keywords you want to optimize the product pages for. 2. Enhanced Content. For new or most important products, consider investing in A+ content – that’s the content that sits below the fold and includes lifestyle images, sidebars, and longer form content. Amazon optimizes A+ content for mobile, so investing in A+ -- even though the content is not indexed at this time by Amazon’s search engine -- is an important way to reach new customers with your brand messaging. Keep in mind that your Amazon product page is your 24-7 sales representative. The more you invest in that page, the better the experience you give your potential customers. Amazon Marketing Services, or AMS, is Amazon's version of Google AdWords. Brands bid on key word phrases, such as “food dehydrator.” When they win the bid, their product ads are displayed on Amazon's results pages. Unlike Google or other search engines, people search on Amazon for one thing: products. 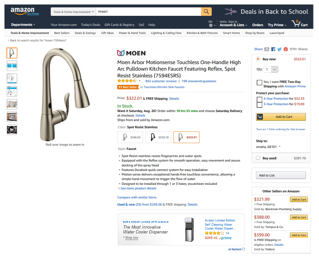 When an AMS ad leads a potential customer to an Amazon product page, they're only a click away from finishing a sale. The "intent to purchase" is built in to the very fabric of an Amazon search, and there is a much clearer attribution of advertising investment to sales than currently exists with social media or Google AdWords investments. I mentioned at the beginning of this blog post that you have options for rising to the top of Amazon search results: organic search and pay-per-click advertising. The greatest lift you can give your product pages is when you combine well-managed AMS campaigns with optimized content. If you’re running AMS campaigns and your data tells you that the keyword phrase “food dehydrator” is driving the most traffic to your product page, you need to make sure that “food dehydrator” is included in your essential content. By aligning your AMS campaigns with your content, you will increase the confidence level of your customers in their search, and you’ll see a lift in conversion. And as consumer behavior evolves, you may need to adjust the keyword phrases in your AMS campaigns and content to reflect those changes. This is what we call “dynamic content” – content that evolves and aligns with consumers’ ever-changing search behavior so your products remain relevant to search. For most brands, ignoring Amazon is not an option. Amazon’s unique position as the world's top online retailer gives them 244 million customers that they, and no other advertising group, can sell advertising to. Some analysts believe Amazon’s advertising business could eventually be worth $150 billion, which would dwarf all advertising platforms in existence today. The writing is on the wall. Brands must list their products on Amazon and invest in ways to get those products discovered. Anything less risks losing market share. Join me for a webinar on Boosting Product Discoverability on Amazon.